Last week I was invited to travel to Paris for the launch of #BOSSparfums . Let’s just say that I was over-the-moon to be travelling to 1 of my favorite cities in the whole world! Paris just oozes effortless style just like the brand Hugo Boss. They always get it right, wether it’s creating a new fragrance or making beautiful garments! I was accompanied by Anneke (editor & creator of Enjoy Beauty magazine -> find it here : http://www.enjoybeauty.eu/ ) and Chrissy from Sparkies PR agency. These 2 fun and energetic ladies were the best company for this trip! I had a blast. I wish that I could tell you more about the #BOSSparfums launch , but it’s still a big secret. I wasn’t even allowed to film or take pictures. The moment I get green light , I will tell you all about. Let’s just say … get excited for something BIG! 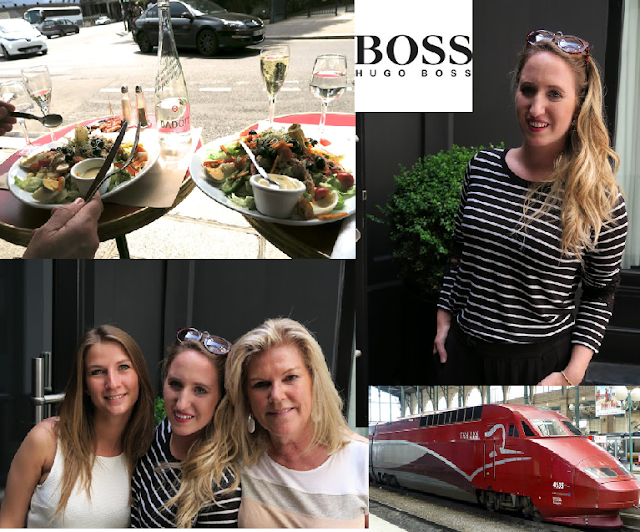 Special thanks to Hugo Boss, Sparkies & Thalys for an unforgettable day! Wow wat een ervaring, ik ben al benieuwd naar het verslag! het was geweldig! Je kan het verslagje zien in de vlog/Youtube filmpje dat bovenaan staat in het artikel! Beautiful! I love Paris. Can't wait to read about Hugo Boss' big launch. I love Paris too!!! Lovely pics, it seems like you had a really great time there! Thank you for leaving nice comment on my blog! Ah super! Zeer benieuwd naar de launch! En het zag er een gezellig dag uit, hopelijk heb je ervan genoten!